When Bing Thom set out to design the Chan Centre, he knew that no matter how visually stunning the building was, if the acoustics weren’t perfect, it wouldn’t be a success. So instead of first designing the concert hall and then working with specialists on the sound, Thom had acousticians from the world-renowned consulting firm Artec create the optimal sounding space — and then worked the architecture around it. 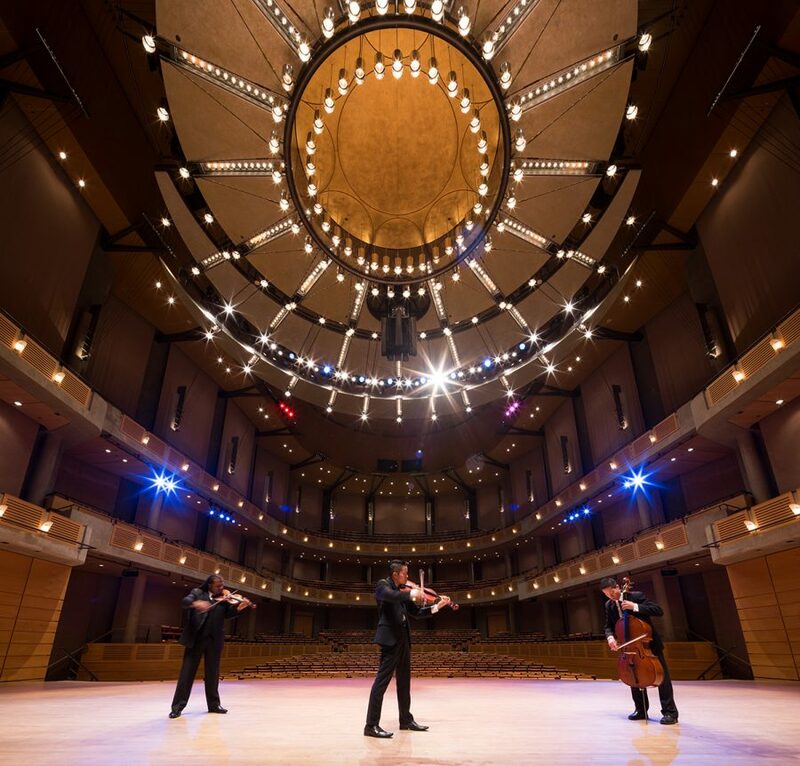 The result is one of North America’s most acoustically refined halls, and one that has served as a model for many others around the world. The Chan Shun Concert Hall is shaped like the inside of an instrument, with the audience sitting in what is essentially the reverberation chamber, and the walls were bush-hammered to create dents that scatter sound back into the room. Motorized banners are raised or lowered to mask the walls, depending on the type of performance and the size of audience, and can shift the length of time the sound reverberates from 2.75 seconds all the way up to 4.5 seconds. As well, every room was acoustically isolated using thick neoprene and double walls, so sound from a performance in one venue doesn’t drift into another. The seating layout and even the seating materials were also chosen based on their sonic properties. But the centerpiece of the acoustical design is the 25-ton steel, cork, and wood canopy suspended from the ceiling that, like the banners, can be raised or lowered depending on the type of music being performed. In other words, the hall can be tuned like a musical instrument. Thom ensured that the canopy was visually striking, too — a modern chandelier that audience members can gaze up at as they listen to beautiful music.